What Is the WTI Oil Price Today? Subject: What Is the WTI Oil Price Today? 3 × nine = Required Please enter the correct value. 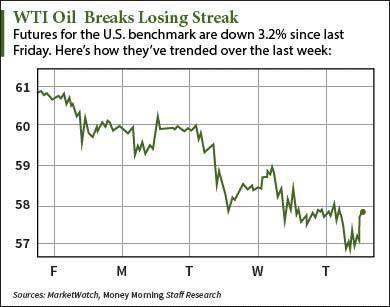 The WTI oil price today (Thursday) broke the benchmark's three-day losing streak amid a surging dollar and new inventory data. At 3:30 p.m., WTI oil gained 0.47% to $57.78 a barrel. The U.S. benchmark has tumbled 4.3% in May, erasing the bullish momentum from the 14.4% gain in April. Brent oil prices moved even higher. The international benchmark was up 0.97% at $62.66 a barrel. Brent is down 6.8% this month. A surging U.S. dollar has pushed the WTI oil price much lower this month. The Wall Street Journal Dollar Index has gained 1.7% in May. The dollar and oil prices are inversely related because oil is priced in dollars. The commodity becomes more expensive to foreign buyers when the greenback rises. "Crude oil is at the mercy of the dollar index," Bob Yawger, director of the futures division at Mizuho Securities USA Inc., told The Wall Street Journal. "You've got so many other pieces you would think would be supportive, but [the market] is totally discounting them." The rise in the WTI oil price today came after the American Petroleum Institute (API) released supply data. Late Wednesday, the API reported that U.S. stockpiles increased by 1.3 million barrels last week. The increase came as a surprise following three weeks of inventory withdrawals. The Energy Information Administration's (EIA) weekly report tells a different story. This morning, it reported a decrease of 2.8 million barrels in crude supplies for the week ended May 22. The data surpassed Platts-polled analysts' expectations of 1.8 million. Although supply is dwindling and demand is rising, some producers are getting beaten down across the board. According to Money Morning Global Energy Strategist Dr. Kent Moors, exploding energy debt is starting to put significant pressure on the sector.